The Reverend Samuel Theophil Bonwetsch is the son of Pastor Christoph Heinrich Bonwetsch and Beate Christiana Friedrich. He was born September 4, 1832 in Katharinenfeld (Caucasus) and lived in Norka during part of his father's tenure as pastor of the Norka parish from 1845 to 1876. Samuel Theophil Bonwetsch. Source: Estonia Museum Portal. Biography of Samuel Theophil Bonwetsch. Source: Estonia Museum Portal. Samuel studied theology at the seminary in Dorpat (now Tartu, Estonia) and was ordained on September 16, 1856. He served in the colony of Galka from 1858-1874; in Fresental from 1875 to 1876, and in Kursk from 1876-1906. 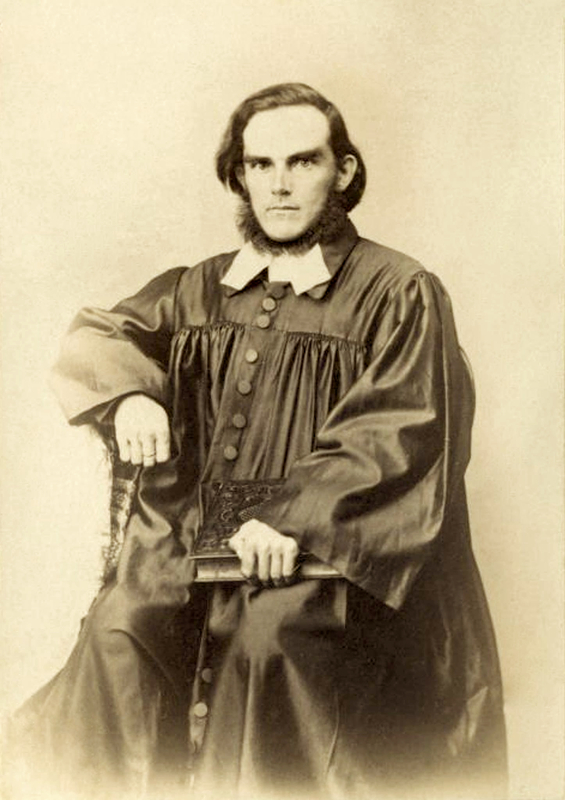 Pastor Bonwetsch married in the colony of Yagodnaya Polyana on December 10, 1857 to Marie Eugenie Hegele, daughter of Pastor Christian Gottlieb Hegele (who also served as pastor in Norka before his father) and Nancy Galloway. Eugenie was born in the colony of Beideck on December 4, 1839 and died May 30, 1910. Samuel and Eugenie are the parents of Pastor Emil Friedrich Bonwetsch and doctor Ernst Gotthardt Leopold Bonwetsch. Pastor Bonwetsch was a founding publisher of the Wolga Volkskalender. Along with Pastor Hölz, this publication became the Friedensboten Kalendar in 1873. These publications were read and used as a reference in many homes in Norka and throughout the Volga colonies. ​Pastor Bonwetsch did much work to improve the educational system in the Volga German colonies during his 20 years of service there. Pastor Samuel Theophil Bonwetsch retired from the clergy in 1906 and from that time lived with his daughter in Sumy, Ukraine until his death from pneumonia ​there on April 26, 1914. Amburger, Erik. Die Pastoren der evangelischen Kirchen Rußlands. Lüneburg, Germany: Institut Nordostdeutsches Kulturwerk, 1998. Schnurr, Joseph. Die Kirchen und das religiöse Leben der Russlanddeutschen – Evangelischer Teil. Stuttgart: AER Verlag Landsmannschaft der Deutschen aus Rußland, 1978: 127. 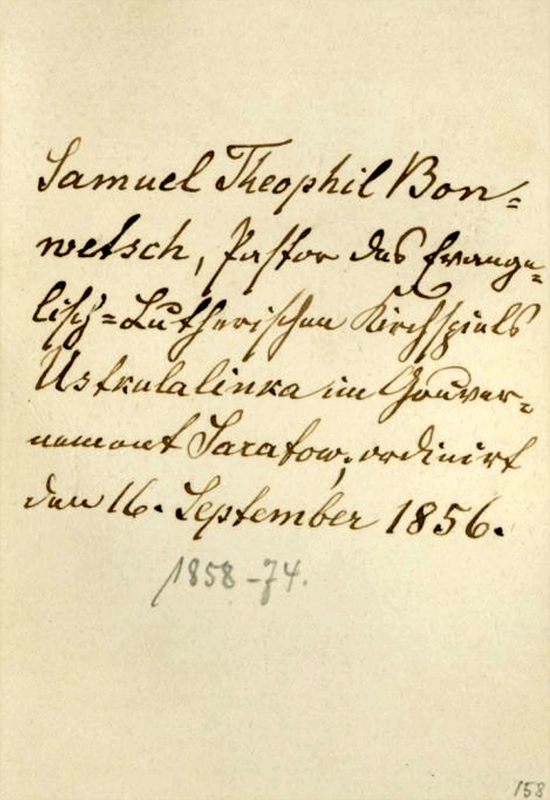 Bonwetsch, Samuel Theophil (wolgadeutsche.ru), accessed August 6, 2018.